November 6, 2017 – Are you interested in integrating transit with your bike commute? Then come to the Salt Lake County Bicycle Ambassadors' event on Thursday, November 9, 2017 from 6:30 to 7:30 pm at 2100 S and State at the Salt Lake County Government Complex Parking lot in Salt Lake City. 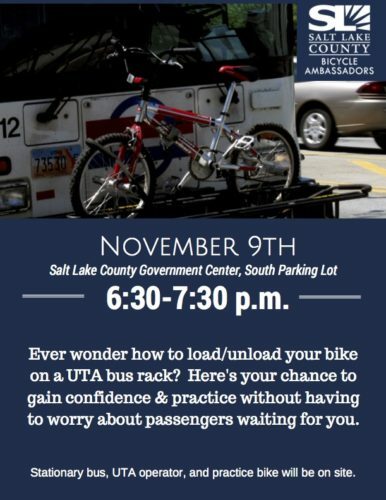 There will be a bus where you can practice loading and unloading your bike on the bike rack. Learn to use the bus bike racks.